These are the most memorable moments in the long history of Survivor Series. Survivor Series is the second oldest World Wrestling Entertainment pay-per-view spectacular. It debuted in 1987 following the third WrestleMania and it became a tradition around American Thanksgiving. Some Survivor Series events took place on the actual Thursday Thanksgiving date, other years it was on Thanksgiving Eve on Wednesday, and then it settled in on Sunday like every other WWE PPV. The concept of Survivor Series in the early days was unique, with teams of four or five people on one side facing off against their rivals in matches where you are eliminated. As the years went by, WWE has gone away from that. These days, the show is about Raw vs. Smackdown and this year’s show has three elimination matches to keep the tradition alive. Survivor Series is also the event where some WWE legends made their debut. Names like The Undertaker (1990), The Rock as Rocky Maivia (1996), Kurt Angle (1999), and The Shield (2012) come to mind. Even the Gobbledy Gooker debuted at the 1990 Survivor Series. What this article is about is a look at the 20 most memorable moments in the history of Survivor Series. The main reason this is about memorable moments is because if I did “greatest” moments, then some of the ones at the end of the list may not even be on here. With that in mind, the focus is on the moments that we think about the most during Survivor Series season. A lot of the moments on here will focus on major WWF/E Championship moments because those are the things fans remember. As I put the list together, I realized that a lot of cheap heel wins have taken place at Survivor Series, which makes sense because it allows the faces to come back to get the titles back a few months later at WrestleMania. Let’s get to it. If you followed the WWE product in the era of Vickie Guerrero and Edge as the top couple on Smackdown in the late 2000s, you know that there always changes that took place without any notice. The WWE Championship match at Survivor Series 2008 was supposed to be Triple H vs. Vladimir Kozlov in what was a slow-paced and boring match. However, Vickie brought back Edge to join the match (Edge was out for about three months after losing to Undertaker at SummerSlam 2008) and Edge ended up leaving with the WWE Title after Jeff Hardy showed up with a steel chair to attack everybody that was in his way. It was a clever way to get the WWE Title onto Edge, who did a great job as an opportunistic heel that used people and capitalized on situations to become a very successful Hall of Fame wrestler. The Undertaker was in his second year in WWE as a 26-year-old that was on the rise and set up to face the WWF Champion Hulk Hogan in a match that was called “The Gravest Challenge.” The match saw The Undertaker, who was a heel at the time, become the WWF Champion when Ric Flair held a chair under the bottom rope and Undertaker hit Hogan with a Tombstone onto the chair. It didn’t even come close to hitting the chair, but that was the idea. This match isn’t on here because it was a great match. Trust me, if you watch it again, you might fall asleep because of how boring it was. It’s here because of the names involved as well as the way the title changed hands. The title reign of The Undertaker didn’t last that long due to the controversy, but we will always remember his first time. There weren’t a lot of great moments in the early years of Survivor Series, but the eight-year-old me will never forget Mr. Fuji’s evil actions at the second Survivor Series in 1988. Mr. Fuji was the manager of the heel tag team Demolition, who were in a tag team elimination match. When Smash of Demolition ran the ropes, Fuji opened the ropes and Smash went crashing to the floor, which led to a countout loss. Smash and Ax yelled at Fuji about it, and Fuji told them he was the boss. They beat up Fuji with a body slam on the floor, which the crowd loved because the fans hated Fuji. The match continued with Fuji helping the Powers of Pain (Warlord and Barbarian) get the win over Los Conquistadors and the Powers of Pain celebrated with Fuji. It was an example of how to effectively do a double turn with Demolition becoming faces and the Powers of Pain becoming heels all thanks to one of the best managers ever, Mr. Fuji. You can watch it on WWE.com here. The main event of Survivor Series 1996 saw Shawn Michaels defend the WWF Title against a former ally in Sycho Sid. The crowd in Madison Square Garden was rooting for Sid to win even though he was the heel and Michaels was the babyface champion. I thought the finish was clever with Shawn’s manager/mentor Jose Lothario getting hit by a camera from Sid. That distracted Michaels, so when there was a ref bump shortly after, Sid hit Michaels in the back with a camera. Fans cheered that too. Sid hit a Powerbomb and became the WWF Champion for the first time in his career. It was actually a pretty good match, which is rare for Sid, but also showed how awesome Michaels was to be able to carry Sid like that. Years later, this match also provided us with this wonderful meme. Another note about this match is that it was originally going to be Vader in this spot, but Michaels hated working with him (Vader had a rep for being too stiff in the ring), so Sid won his first WWF Title because of it. Vader passed away earlier this year, and Lothario also died about a week ago. The match was Bret defending the WWF Title against the crazy heel Bob Backlund, who was 45 years old and former WWF Champion. Owen was in Backlund’s corner while Bret had his brother-in-law the “British Bulldog” Davey Boy Smith in his corner. After about 30 minutes, Davey chased Owen outside the ring, Owen moved, and Davey went face first into the steel steps. With Davey out of the way, Backlund applied his Crossface Chickenwing submission on Bret. Owen capitalized on the situation by trying to convince his parents Helen & Stu Hart to toss in the towel for Bret. Backlund had Hart in the hold for several minutes, so Helen eventually tossed in the towel even though Stu tried to stop it. It’s not a great match and shouldn’t be remembered as such, but I thought it was a such a creative finish that fit Owen’s character perfectly. Backlund lost the WWF Title three days later when he dropped it to Diesel at a live event at Madison Square Garden. That’s the true definition of being a transitional champion. There’s only been one Money in the Bank cash-in at a Survivor Series, so I felt like it was worthy of being on this list. Roman Reigns beat Dean Ambrose to win the vacant WWE Championship and he celebrated for a few moments, but that celebration didn’t last long. When Triple H walked out to the ring to congratulate Reigns, the new WWE Champion didn’t want anything to do with that and he hit a Spear on Hunter. When Reigns turned around, Sheamus showed up with a Brogue Kick followed by a Money in the Bank cash-in. Sheamus covered, only got a two count, and hit another Brogue Kick to win the WWE Title in less than one minute. It was good booking to screw over Reigns and when Reigns won the WWE Title again shortly after this, the fans did support him a lot more. It didn’t last, but I think this angle worked at least in the short term. I was at this show in Toronto two years ago. I remember there were about 30 minutes until the top of the hour, so I was wondering how much time the 49-year-old Bill Goldberg would get for this match. Goldberg dominated the match with two Spears and a Jackhammer. Goldberg won the match officially in 1:26 much to the surprise of everybody watching. Lesnar dominated nearly every opponent he has been in the ring with this decade, yet here he was losing in under two minutes. I thought Lesnar would win the match easily. There was just no way WWE was going to have him lose, right? Well, they did. Going into the show, Goldberg was only going to wrestle one match. However, WWE was so happy with the response to him, and he loved being back in the ring, that he agreed to do more. He ended up working the Royal Rumble, Fastlane (where he won the Universal Title), and then he lost the Universal Title back to Lesnar to end the feud. There’s only been one Hell in a Cell match at Survivor Series with Batista defending the World Title against The Undertaker in 2007. They wrestled several times that year and had great matches every time, so this match was considered the end of the rivalry between the two most popular guys on Smackdown. It looked like The Undertaker was going to win at around the 20 minute mark when he hit a Tombstone on the steel steps. Just as he went to cover Batista, Edge (dressed as a camera guy) pulled the referee out of the ring. Edge took the camera and hit Undertaker in the head with it, and followed it up with a Conchairto chair shot with a chair to the steps into Undertaker’s head. Edge put Batista’s hand on Undertaker’s chest and the ref counted the pinfall to keep the title on Batista. We didn’t know it at the time, but it was the perfect way to set the stage for Edge vs. Undertaker at WrestleMania 24 about five months later. Here’s another moment from Survivor Series 1988, which is hardly a great show, but at least they gave us some things to remember. The WWF Champion Randy Savage and good friend Hulk Hogan formed the Mega Powers team that main evented the show that year. It was a 4 on 2 advantage for the bad guys, but Savage and Hogan managed to eliminate Ted Dibiase, Big Boss Man, Akeem (the African Dream! ), and Haku to win the 30 minute match. The big story was what happened after the match. Hogan did his flexing routine that he always did after a big win and he picked up Savage’s manager Elizabeth, who was Savage’s real life wife at the time (their TV wedding was in 1991). When Savage saw Hogan holding Liz, Savage was furious and had an angry look on his face. Hogan had no idea that Savage was mad about it and that’s how the show went off the air. It was a subtle way to tease what eventually happened between them. Savage attacked Hogan backstage a few months later and that set up the WrestleMania 5 main event between them. The build to that match was incredible and their actions at Survivor Series played a huge part in that. This was one of my favorite matches in Survivor Series history because it was the end of Diesel’s boring reign as WWF Champion and everything felt right again with Bret Hart as the champ. The two things I’ll always remember are the big bump that Bret took and the creative finish. The big bump happened when Bret was on the apron, Diesel charged at him and Bret bumped off the apron through a table at ringside. It was the biggest table bump in WWF history at the time. Years later, those things happened all the time, so credit them for being innovative. The finish was great because they told the perfect story (no surprise in a Bret Hart match) with Diesel using his size to dominate most of the match. They went just under 25 minutes, and Diesel set up for the Powerbomb (his finisher) after the table spot. Hart collapsed to the mat, though, so it looked like he was done. When Diesel tried to pick him up again, Bret did a small package and got the pinfall win. The crowd loved it. Post match, Diesel was swearing in the ring, he hit Hart with a Powerbomb, and he beat up referees. It was a heel turn for Diesel after the title loss, and the whole thing was booked brilliantly. I recommend it if you haven’t watched it in a long time. It’s tough to pick one Survivor Series elimination style match as the best of all time. The one that stands out to me is the Raw match from Survivor Series 2003 with Steve Austin’s team of faces facing Eric Bischoff’s heel squad. The reason it’s the best is because of the performance of Shawn Michaels, who was on Austin’s team. The match was built around Michaels finding a way to survive as the last man on his team going up against Randy Orton, Chris Jericho, and Christian. It was Orton’s second year on the main roster and it was obvious that WWE had big plans for him as a main eventer, which he became less than a year later. Michaels eliminated Christian with Sweet Chin Music. Michaels managed to get rid of Jericho with a rollup counter to the Walls of Jericho, so Jericho hit him with a chair to the face. Michaels was a bloody mess after that. Bischoff kicked Michaels, so Steve Austin got rid of Bischoff and hit a Stunner on Orton. The fans were going crazy for this stuff. It looked like Michaels would win, but Batista came in through the crowd and hit a Powerbomb on Michaels, and Orton crawled over to cover for the win. It’s an outstanding match thanks to Michaels, while also putting over Orton and Batista in a big way. It was a smart way to do the match because not only are you getting a great performance from Michaels, but it put over Orton and Batista as future top guys as well. Ted Dibiase introduced The Undertaker, managed by Brother Love, at Survivor Series 1990. Some of us knew The Undertaker as Mean Mark in WCW, but he didn’t get very far as that character. It was smart of WWE to sign the 25-year-old and give him a gimmick that would last nearly 30 years later. The Undertaker had a dominant performance, eliminating both Koko B Ware and Dusty Rhodes. Shortly after he got rid of Dusty, Undertaker was eliminated by countout, probably because WWE’s creative minds didn’t want him to take a pinfall loss, which is understandable. The Undertaker’s actual debut was at a TV taping before this as “Cain The Undertaker” (watch it here if you want) although most of us had no idea about that at the time. Survivor Series 1990 is always going to be considered the show where he made his debut. In the intro to this article, I mentioned why I didn’t call this the “greatest” moments in Survivor Series history is because there are a few things that happened that were memorable, but not great in terms of happy moments. This would fall into that category. It was known at the time that Steve Austin had a serious neck injury, yet he was still advertised for a triple threat main event with WWF Champion Triple H and The Rock. During the show, Austin was shown in the parking lot when somebody hit him with a car and a stunt double took the bump for Austin. It was a way to write Austin out of storylines so he could have major neck surgery. Austin, who was the top guy in the WWF at the time, missed nearly one year of action because of the surgery. When he came back, Rikishi (“I DID IT FOR DA ROCK!”) was revealed as the driver, which was the company’s way of turning him heel. It should have been Triple H, who basically took the blame for it. I don’t think anybody is ever going to forget this angle. Could it have been booked better in terms of the reveal and who it was? Absolutely. I’m sure WWE wishes they could go back to fix that. This is another candidate for best elimination match in Survivor Series history and probably the match that I would rank first. I know that some people frown upon it because WWE rushed through the Invasion angle way too quickly (it should have taken years, not six months), but if you watch the match again and listen to the crowd, it was such a huge moment in the company’s history. There was a WWF face team with The Rock, The Undertaker, Chris Jericho, Kane, and Big Show taking on The Alliance (WCW and ECW) heel team of Steve Austin, Kurt Angle, Rob Van Dam, Shane McMahon, and Booker T. To nobody’s surprise, the match came down to Rock and Austin with Jericho trying to cost his team the win, but The Undertaker stopped that. After a crazy few minutes of action, Kurt Angle hit Austin in the head with the WWF Title much to the delight of that fans and Rock hit a Rock Bottom to pin Austin to give Team WWF the win. That led to a smiling Vince McMahon on the stage looking like a proud papa. It’s such a fun match that was booked well with a very creative finish. The match holds up very well and at 45 minutes, it doesn’t feel that long either. I like this match a lot. One of the biggest names in the history of pro wrestling finally made his WWE debut at Survivor Series 2014 when 54-year-old Sting showed up to confront Triple H. The former NWA/WCW legend spent most of the 2000s working for TNA/Impact Wrestling, but in 2014 he became part of WWE’s 2K video game series. When WWE officials heard the crowd response for the commercial for the game, they decided to bring him into the company. The main event of Survivor Series 2014 with a Triple H-led Authority heel team taking on Team John Cena, which was trying to stop Triple H. It came down to Seth Rollins for the Authority team and Dolph Ziggler for the Cena team. 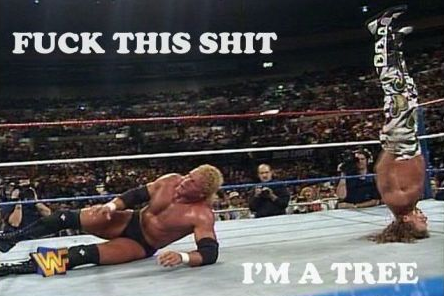 Triple H got involved, hit Ziggler with a Pedigree, and shortly after that, Sting’s music it. The legendary Stinger walked down to the ring, fans chanted “this is awesome,” and Sting hit Hunter with a Scorpion Death Drop. Sting ended up putting Ziggler on top of Rollins to give Ziggler’s team the win. It was such a cool moment to see the Stinger finally in WWE, although we all wished it happened a decade or two earlier. Better late than ever, I guess. The stipulation meant that Triple H and Stephanie were no longer in control of the company, but that only lasted a few weeks because this is WWE. They aren’t good at sticking to stipulations. The best match in Survivor Series history? I would go with Bret Hart vs. Steve Austin in 1996. I loved the build to it with Austin as a cocky heel that called out Bret Hart, who was off for about six months post-WrestleMania and returned to face Austin in this show at MSG. The match was incredible with Austin wanting to prove he was on Hart’s level, while the veteran Hart was trying to show that he still had it. It was great that they were given 29 minutes to tell a story with so many different submission moves being used, a lot of believable nearfalls, and a clever finish. Austin had Hart trapped in the Million Dollar Dream sleeper, Hart walked towards the turnbuckle, pushed himself off against that, and covered Austin while he was on the hold, so Austin lost because he didn’t release the hold. It’s like what Bret did to beat Roddy Piper at WrestleMania 8. This was the true breakout match for Austin. King of the Ring 1996 earlier in the year helped get his character over thanks to the infamous “Austin 3:16” promo, but it was this match that really elevated to that near main event level. They did the match again at WrestleMania 13 about five months later and that match was even better than this one. I rated both matches at five stars out of five on the five-star scale if you’re into that sort of thing. Go out of your way to watch this one before this year’s Survivor Series, because you’ll love it as much as I do. Here’s another example of a moment that nobody saw coming, yet looking back on it all I can do is smile about how brilliant it was. CM Punk was the heel WWE Champion defending against two face rivals in perennial top guy John Cena and star on the rise, Ryback. The assumption was that Punk would retain, but we didn’t now how. After Ryback was about to win the match, the trio of Seth Rollins, Dean Ambrose, and Roman Reigns (later to be known as The Shield) showed up in all black attire. They attacked Ryback around ringside and gave him a three man Powerbomb through the announce table. All three guys were identified by announcer Michael Cole with most of us “smart” fans knowing Seth Rollins and Dean Ambrose due to being indy wrestling stars under different names, but Reigns was mostly an unknown at that point. While The Shield’s debut was legendary, I had a problem with the finish. Ryback hit Cena with the Shellshock finishing move and Cena just laid there for about three minutes while The Shield attacked. Earlier in the match, Cena kicked out of Punk’s GTS easily, yet he can’t move after Ryback’s finisher? I think another GTS from Punk should have happened for the finish. Instead, Punk just covered Cena and won. It’s still a very memorable moment. It would have been even cooler if it was booked better. Initially, the group was going to b aligned with Punk, but that was scrapped and they became their own entity. It’s never easy to do the “first” of any match type, but if you’re going to do it then you might as well call on the man that was in the first Ladder Match in WWE history (on PPV anyway because there were taped ones) and the first Hell in a Cell match. That man was Shawn Michaels, who was wrestling in just his second match in four years since retiring (for the first time) due to back surgery. 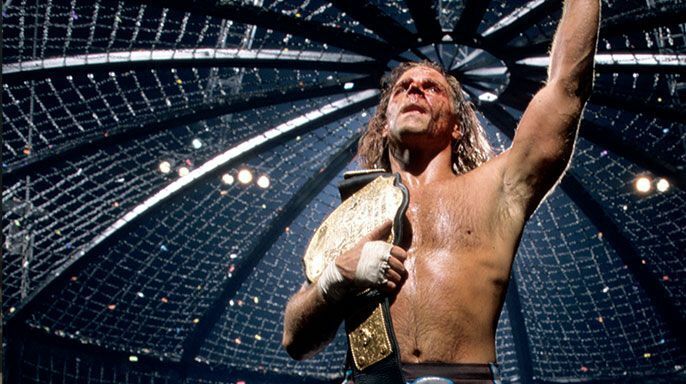 The World Heavyweight Title, which was held by evil Triple H, was on the line in the Elimination Chamber match concept at Survivor Series 2002. In storyline, they said it was Raw GM Eric Bischoff’s idea, but it was Triple H’s idea along with other smart minds in the company. The others in the match were Chris Jericho, Rob Van Dam, Booker T, and Kane. Everybody watching at home knew it was really about Hunter and Shawn. There was a scary moment in the match as RVD hit a Frog Splash off a pod onto Triple H in the ring, which led to RVD’s leg crushing the throat of Hunter. I don’t know how Triple H got through it, but he did and then he spent the night in the hospital due to the injury. After disposing of RVD, Booker, Kane, and Jericho in that order, it was down to Hunter and Shawn. It was a very dramatic closing scene with a bloody Triple H (it only took him two minutes to blade in the match!) hitting a Pedigree and a slow cover that only got a two count. The crowd at MSG was so into this match. Michaels hit a back body drop to get out of a Pedigree attempt and Michaels hit the Sweet Chin Music superkick for the pinfall win. The match went 40 minutes and is arguably the best Elimination Chamber match in WWE history after 16 years of doing these matches regularly. The 1998 Survivor Series pay-per-view is one of my favorite WWE shows ever. It’s not ranked that highly because of the match quality, and there are only one or two matches on there that are above average. The reason I rate it so highly is because of the story told throughout the night in the “Deadly Games” tournament for the vacant WWF Title. It looked like Mick Foley aka Mankind would be the hand-picked WWF Champion by Vince McMahon, but then in the finals, there was a major twist that most people didn’t see coming. Before getting to the finals, it’s important to note that there was a big heel turn in the semifinals when Steve Austin was about to pin Mankind, but Shane McMahon showed up in a referee’s shirt to count the pin and just before the three count, Shane gave Austin the double middle fingers as if to say “f**k you, pal.” Mankind ended up winning after a chair shot to Austin’s head with Shane counting the pin. In the main event, The Rock had the crowd behind him because he was a popular face for about two months going into this match. The fans just loved the guy. When Rock went to apply the Sharpshooter, Vince McMahon (who was at ringside with son Shane) told the timekeeper to ring the bell and The Rock was announced as the winner. It was a Survivor Series screwjob for the second year in a row. The whole tournament was booked so well with other heels on the show “accidentally” helping Rock win matches leading up to the finals performance where Rock won thanks to Vince. It elevated Rock from young midcarder with a bright future to 26-year-old (youngest ever at that time) WWF Champion that the WWF could build around. The show ended with Austin going out there to seek revenge, which was a nice tease of their WrestleMania 15 main event match. If you have never seen this show or haven’t watched in a while, give it another watch before this year’s Survivor Series. It was the kind of creative booking we all wish WWE could do on a consistent basis. At least they got it right 20 years ago. Vince screwed Bret? Bret screwed Bret? It’s all up to you to decide what you believe, but if you are a fan of World Wrestling Entertainment, then you probably lean one way or the other on those questions. It’s an incident that is famously known as “The Montreal Screwjob” or simply the screwjob. If you mention Montreal to most WWE fans, I bet you that the first thing they’ll think of is Survivor Series 1997 because of what happened that night. Bret Hart was the WWF Champion, and he was leaving the company to join WCW because Vince McMahon told him that he couldn’t afford to pay him anymore. Before Bret left, Vince wanted Bret to put over Shawn Michaels. The problem with that is that earlier that summer, Hart and Michaels got into a legit fight backstage where they had to be separated. Michaels was basically benched by the company for a month or two while Hart went on to win the WWF Title at SummerSlam 1997. Bret was reluctant to put over Michaels at Survivor Series because he didn’t want to lose in Canada (Bret is a Canadian hero) and also because Shawn said that he would never put over Bret, so that infuriated Bret. Since Bret had creative control in his WWF deal, he could nix Vince’s plans if he wanted. As documented in the excellent Wrestling with Shadows documentary, the agreed upon planned finish was for something to happen where Bret’s allies Owen Hart (brother), British Bulldog, and Jim Neidhart (both brothers-in-law) would partake in a “schmozz” ending, meaning they all go in the ring leading to a disqualification. They would figure out the plan to drop the title on another note, perhaps on Raw in Ottawa or later down the road, and Bret was fine with it as long as it wasn’t Shawn. The match between Bret and Shawn was pretty good for the 13 minutes that it took place. Vince McMahon showed up at ringside, which was rare because there was no reason for him to be out there. When Shawn Michaels went for Bret’s own Sharpshooter, referee Earl Hebner called for the bell while Vince McMahon told the timekeeper to “ring the f**king bell” and Michaels was awarded the WWF Title. Michaels acted like he had no idea what was happening, but years later he revealed that he knew. Bret was furious about it, turned to Vince, and spit right in his face. The show ended with Bret making “WCW” hand gestures and destroying monitors at ringside. Backstage after the show, Bret decked Vince with one punch and gave Vince a black eye. I wrote a lot more about this story last year on the 20 year anniversary of the Montreal Screwjob including the backstage stories. To the people that think it was all some giant plan (or work as they say in wrestling), you are very wrong. There have been many people over the years that have taken credit for the idea of who came up with it. I think only Vince McMahon can answer that question, but he’s not the type of guy to talk about that stuff publicly. Vince Russo, who was a WWF writer at the time, takes credit. Others have cited longtime WWE employee Gerald Brisco for it, and some people even credited Triple H. What I believe is that it was a team effort with Vince McMahon making the final call. Here’s an interview with Bret talking about Survivor Series 1997 and saying he’ll never forget what happened. I can’t say I blame him either. As for Vince McMahon, he did what he had to do. He was paranoid about Bret possibly taking the WWF World Title to WCW and felt that he had to do whatever he could to prevent that from happening. That’s why they took the title off Bret that night. Could it have been handled differently? Absolutely, but in Vince’s eyes he had to do it that night and that they couldn’t wait to do it. You could also say that this incident changed wrestling forever. Vince McMahon soon became the biggest heel in the wrestling business as the evil Mr. McMahon character and the fans became more passionate about the WWF product. Six months later, they passed WCW as the number one wrestling company in the world again. Without this incident, who knows if the WWF would have gained the kind of momentum needed to pass WCW in the Monday Night Wars. My take is that Vince screwed Bret and he should have handled it differently. I understand why Vince did what he did, but he should have been more respectful to Bret, who was one of the most loyal employees he had for over a decade. Vince could have handled it better. When it comes to Survivor Series, the first things any WWE fan is going to think about is Bret, Shawn, Vince, Montreal and 1997. That’s why it is the most memorable moment in Survivor Series history. Thanks for reading.